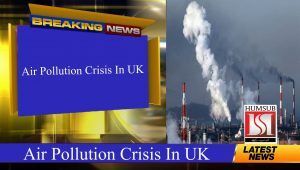 Air Pollution Crisis In UK: The UK government is putting the health of millions of its citizens at risk by failing to tackle the country’s air pollution crisis, according the UN’s special rapporteur on human rights and the environment. David Boyd said people’s right to breathe clean air was being violated in the UK and warned the crisis was responsible for up to 50,000 deaths – and devastating the lives of “many millions” more in towns and cities across the country. Air pollution and climate change were inextricably linked and called on the UK government to take a global lead by introducing new clean air legislation to raise standards, protect its citizens and meet its climate obligations. The intervention follows a slew of new scientific studies over recent months that have highlighted the long-term damage air pollution is doing to people’s health, from asthma to dementia, damage to unborn babies and heart disease. Last month the world’s biggest children’s charity, Unicef, told the Guardian it had refocused its UK operation to tackle air pollution because of the scale of the “health crisis” facing young people in the country. It also follows a landmark UN climate report that warned we only had 12 years to avert disastrous climate breakdown. The UK government has been widely criticized by clean air campaigners and environmental groups over what they say has been its failure to tackle the air pollution crisis. It has been defeated three times in court over its plans on the issue and is now one of six countries taken to the European court of justice over their toxic air. It also called on individuals to take action, from burning only the “cleanest fuels” to “leaving the car at home on the school run”. Boyd, who took up his post in August, said the crisis in the UK was part of a global public health emergency that kills between 6 and 7 million people a year. Children are among the most susceptible to toxic air. Last month the Guardian reported how youngsters in the UK were getting a disproportionate amount of air pollution during the school day. One primary school was found to have levels several times over the World Health Organization limit for the most damaging particulates inside its classrooms. However, Boyd said he remained optimistic that the global air pollution crisis could be overcome, pointing out that repeated studies into the cost of tackling air pollution have shown “absolutely clearly that the net benefits are in the trillions of dollars”. “There is no economic argument against cleaner air – in fact, this is one of those rare instances where our environmental objectives, our economic objectives and our social objectives line up very neatly,” he said.